LITHONIA, GA — Bishop Eddie Long, the often controversial pastor of the New Birth Missionary Baptist Church, died Sunday morning, January 15, 2017. He was 63 years of age. His church confirmed Pastor Long’s death earlier Sunday. Services will be held at 11 a.m. Jan. 25 at New Birth Missionary Baptist Church, 6400 Woodrow Rd. in Lithonia. Long will lie in-state from 8 a.m. until the service begins. Visitation will be held from 11 a.m. until 7 p.m. Jan. 24, at the church, according to Gregory B. Levett & Sons Funeral Homes & Crematory, which is in charge of arrangements. Deeply committed to his church, even in his last days, Bishop Long delivered his final message to New Birth as we ushered in 2017. He told the church that God was already working in our favor and what we have been praying for was already manifested. In his departure, we receive that and as faithful members of New Birth, we praise God for the life of Bishop Long. Bishop Long was known as one of the most influential faith leaders in the world. He stood strong as a Kingdom Builder, pioneering leader, and revolutionary mind changer. Long was a family man and spiritual leader who was well respected and loved for his passion to unapologetically and courageously preach the gospel of Jesus Christ. Long inspired thousands of believers around the world through his global ministry that literally changed lives. Through his earthly battle, Bishop Long believed that God was once again using him to help others see the power of the Holy Spirit through the love New Birth displayed to him and the countless prayers sent up by others from every corner of the earth. 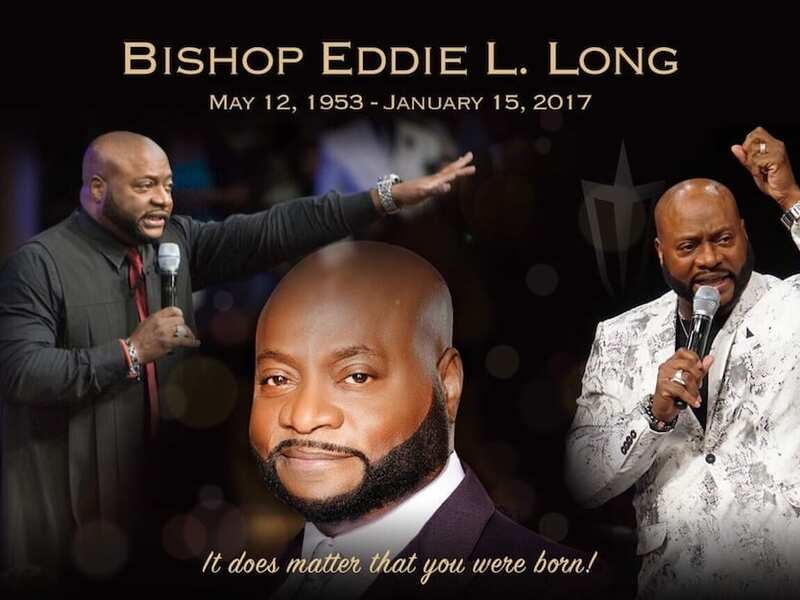 Bishop Eddie L. Long is survived by his beautiful wife, First Lady Elder Vanessa Long, 4 children Eric, Edward, Jared and Taylor and 3 grandchildren. The Long family thanks you for your prayers, condolences and messages of love. The family appreciates your support and respect of their privacy, as they prepare along with New Birth, for the homegoing service to honor Bishop Long.